How you can help - What does the Future hold for Dugongs? The World Conservation Union have listed Dugongs as vulnerable to extinction. This is because these sea mammals have been hunted for approximately 90 years now for their meat and blubber even though they are totally harmless to society. Defenceless and powerless, they are shot violently by poachers with those big harpoon guns which are also used to kill whale. Luckily, Green Peace and many more environmental organisations are trying their best to put these occurences to a complete halt. These bulky sea cows are also occasionally encountered in a collision with boats, which leads to a death of a dugong, but now, the tolls of these unfortunate deaths are slowly increasing. Also, dugongs are in this situation of vulnerable to extinction because of the scaricity of sea grass, which as you already know, is its main food supply. Dugongs are vegatarians so without sea grass they cannot hunt for other animals to eat and survive. So please find a soft spot in your heart and react. Feel angry, hurt, emotional. No matter, just get up and help. - Do not litter into oceans or anywhere else otherwise the wind will pick the trash up and may blow into the sea, where dugongs live. - Before you go on a private boat (owned by you or relatives, friends etc.) make sure your boak isn't leaking oil as that pollutes to sea and kills many animals. - When you are on a boat, whether driving or just a passenger, steer slowly and cautiously in the areas of where dugongs or other marine life might be. Dugongs are most likely to be around the seagrass areas as they feed on them, so stay clear of those areas as well. Also, always be on the look out and try to avoid any collisions with any marine animal as this may prove fatal to the victim. - Do not drop any type of net in the water as dugongs might get caught up in them and will unfortunately die. 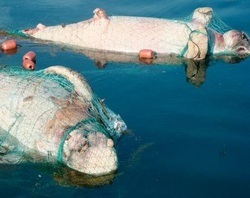 At the bottom and top of the page, I have provided you with images of some dugongs caught up in a net.